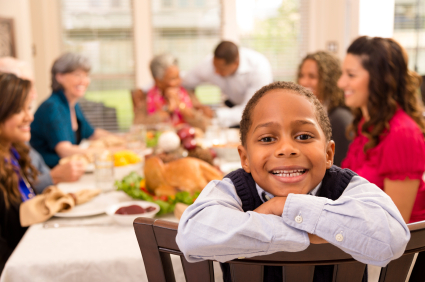 The holidays offer many opportunities for children to practice executive functioning skills. Below are some holiday-themed ideas and activities that incorporate the skills involved in executive functioning. Hanukkah offers many opportunities for various kid-friendly cooking, games, and rituals. The Winter Solstice is celebrated by many different ethnic groups; each has a different name for it: Yalda (Iranian), Modraniht (Saxon), and Saturnalia (Roman). Kwanzaa is a week-long celebration that focuses on positive character traits, giving, and feasting. Complete a craft project that requires planning several steps. 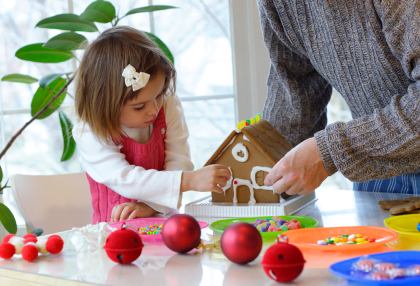 A great holiday project that any child enjoys is creating a gingerbread house. Kits are available at large retail stores and grocery stores. It is also easy to construct a smaller “gingerbread” house using a small empty milk carton as a mold for graham crackers. Use icing to glue the crackers to the sides and top of the cartons, and then use it to glue decorative candies to their houses. Have your children separate the pieces, plan their creation, and then take action! Organize gift-wrapping supplies and holiday decorations. There are several solutions to organizing wrapping paper supplies available at home hardware stores, but you can also use old shipping boxes, a large gift bag, large plastic storage bags, or plastic storage bin to keep tape, ribbons, tissue paper, and other supplies at bay. 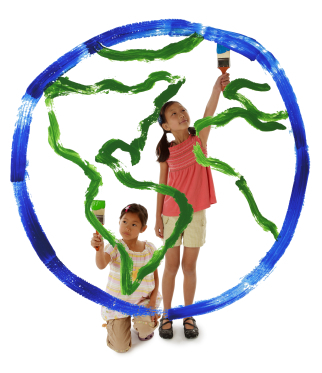 Enlist the help of your children, or give them this project to do on their own. The Freeze game. Play music for your children, and encourage them to dance! But when the music stops, they must freeze until it starts again. Dance quickly for fast-tempo songs, and dance slowly for slow-tempo songs. These cues can also be reversed, so that they dance slowly to fast music and vice versa. Color-matching freeze. In this version of the freeze game, children are assigned colors. When the music stops, they must find a colored mat and stand on it. Drum beats. Children are to respond to different drum cues with specific body movements. For example, they might jump in place when they hear a fast drum beat and walk in slow circles when they hear a slow drum beat. These cues can also be reversed after the children have grown accustomed to them. Tominey S, & McClelland M. (2011). Red light, purple light: Findings from a randomized trial using circle time games to improve behavioral self-regulation in preschool. Early Education & Development 22(3): 489-519. As Thanksgiving approaches, we often reflect on the things in our lives for which we are thankful, both big and small. Perhaps you have developed “thankful rituals” and passed those on to your children, such as making lists of all the reasons to feel gracious and thankful to share with the rest of the family during the Thanksgiving feast. How quickly that attitude of gratitude can turn into commercialization and mile-long wish lists of the holiday season. By the time we ring in the New Year, we have often forgotten about Thanksgiving and the thankful attitude that accompanies it. It is easy to lose thankfulness in the hustle and bustle of everyday life, but there are some things we can do and things we can model for and encourage our children to do that will foster thankfulness all year long. Keep a daily Gratitude Journal. At the end of each day, write down two or three things in your gratitude journal. Help your children to create their own journals, and encourage them to participate. This activity can be a great addition to the bedtime ritual, and it teaches your children to be reflective of the day. Very young children might need help with the writing, but they can certainly draw pictures to accompany your words. Feeling gracious every day for the good things that happen in our lives can help to foster an overall positive outlook and optimistic attitude. Once you have maintained a journal for a full year, it can be fun to read the things for which you were thankful the year before in addition to writing new things for the current year. You can also do a project as a family such as My Family’s Thankful Book. Make “Thank You” a frequent part of your interactions. How often do we say, “Thank you?” We might ask our children to do things, such as pick up their toys or wash their hands before dinner; but, how often do we then thank them for following these directions? How often do we thank them for displaying proper table manners, for sharing their toys with each other nicely, or getting dressed by themselves? As parents, we have to model the kinds of behaviors we want to see in our children. Therefore, thank them sincerely and often! Reinforce them, as well, when they thank you and other adults, as well as when they thank each other. In addition to brightening someone’s day, you can also teach your child a valuable lesson in the kinds of services these people provide, and why they deserve our thanks. Practice self-appreciation. Appreciate your self by giving your bodies and minds proper care. We do this by getting enough sleep, eating balanced diets, getting plenty of rest, keeping our minds appropriately stimulated, and having time for play. Model these behaviors for your children and encourage them to take care of themselves physically and mentally. These are just a few ideas for keeping an attitude of gratitude all year long, not just during the Thanksgiving season. Remembering often to take care of ourselves, to recognize the positive influences others have in our life, and to appreciate things that others do for us will not only keep us gracious, but will model these behaviors and attitudes for our children. Summer is over, and the new school year is in full swing! 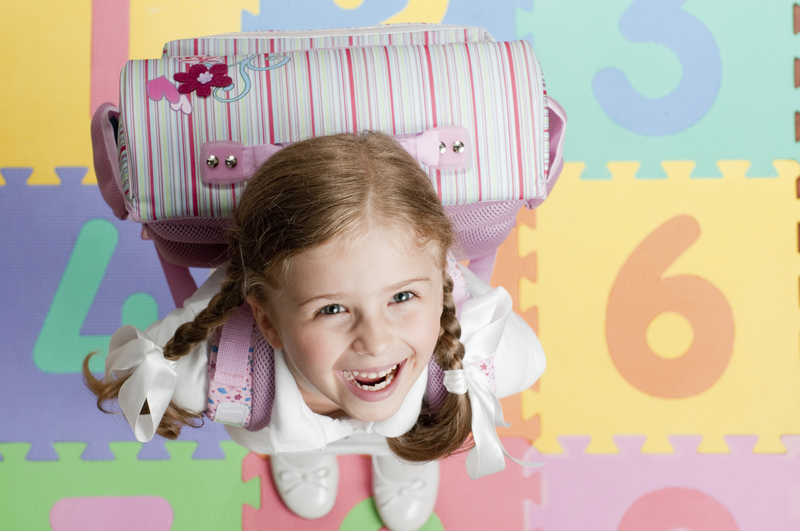 It’s not always easy for younger children to adjust to the routines and demands of school. As parents, there are many things you can do to help “prime” your children to be successful in school. Establish a consistent routine at home. Children who have consistent routines at home are more likely to accept and adapt to the routine and scheduled day they have at school. Consistent daily bedtimes and wake-up times are very important in setting your child’s sleep and wake-up schedule. Consistent mealtimes and snack times will help regulate his/her hunger patterns and energy levels. Having routines at these times, such as always washing hands before meals and always reading for a few minutes before bed, helps children understand and accept the steps that are involved in routines at school. Enforcing the completion of homework before fun and games not only gets homework out of the way before it interferes with dinner and bedtime, but it also teaches your child to prioritize schoolwork over play, which creates better habits for the future. It might also be helpful to ask your child’s teacher to describe any consistent routines in the classroom so you can attempt to mimic them at home. Establish an organized workspace at home for your child. Whether your child completes his/her homework at a desk in her bedroom or at the kitchen table, it is important to have all the necessary supplies, such as paper and pencils, readily accessible and organized. A small desk with drawers can be great for this, but if your child prefers to work at the kitchen table, a container large enough to hold paper and pencils is a great way to keep these supplies at hand when needed and tucked away when it is time to set the table for dinner. Do morning legwork the night before. All supplies for school should be packed up and ready to go before your child goes to bed so that he/she is not frantically searching for his/her books and homework as he/she heads out the door to catch the bus. It might also help to pack lunch and choose his/her clothing before he/she goes to bed. This can all be part of his/her nightly routine! Read with your child at least 20 minutes a day. Research shows that children who engage in at least 20 minutes of reading activities at home with their caregivers are more likely to be successful readers. Family reading time is an important part of your daily routine because it emphasizes the importance of lifelong learning and allows your child extra time to practice reading skills. Whether you sit together on the couch and read to yourselves silently or read a book out loud together, this is a great way for you to be involved with your child’s reading. When time is up, have a discussion about what you are each reading, including a synopsis and perhaps the most interesting fact you each learned from what you read. Get to know your child’s teacher. Not only is it important that you have open lines of communication with your child’s teacher, but it is also important for your child to know about it. In this age of technology, most teachers are readily available via email to answer your questions. Many schools also offer websites for each specific class with online bulletin boards where you and your child can post questions or start discussions. Teacher websites are a great resource for finding out about any upcoming important information, such as projects and field trips. Let your child see that you respect her teacher and have a good, open relationship with him or her. Modeling that respect for your child’s teacher will go a long way toward enhancing your child’s own attitude toward her teacher! Academic standards for today’s kindergarteners are much more rigorous than they were for today’s parents. Nevertheless, research indicates that kindergarten teachers feel that “executive functioning” skills, or skills that allow a child to control his or her behavior and emotions in a variety of settings, are better indicators of school readiness in today’s five-year-olds than academic readiness skills such as knowing the alphabet or being able to hold a pencil (Dockett & Perry, 2003). In fact, 75 percent of kindergarten teachers polled by Heaviside and Farris (1993) felt that children who are in good physical health, who have the ability to verbally communicate wants and needs, and who are curious and enthusiastic about participating in new activities are likely to successfully transition to a formal school environment and be successful during their kindergarten year. Fifty percent of the same group of teachers felt that behavioral control, empathy, and socialization skills were also important skills for students to possess prior to entering kindergarten. Teachers of preschool-aged children can directly influence and enhance the development of these skills that will help ensure school success. Children who have not learned these skills often develop behavior problems that then need to be managed, so it is important to expose them to activities and experiences that will enhance the development of these skills prior to their first day of formal schooling. In order to foster self-confidence in young children, it is essential to use positive language as much as possible. When giving praise, it is important to be specific and praise actions and behaviors. For example, “You are doing a great job sharing your toy with Bobby,” is a much more informative statement than, “You are being good right now.” Telling a child specifically what he is doing right informs him of how to behave again in the future. These verbal reinforcements of positive behaviors will naturally decrease negative behaviors, because children want to behave in ways that please their caregivers and provide themselves with positive attention. It is this positive attention that also increases their sense of self-confidence and self-efficacy. Prior to entering school, children should be exposed to a variety of social situations. 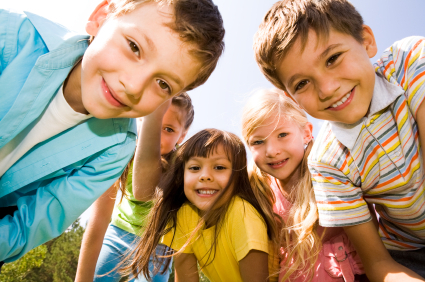 Whether through team sports, group activities, lessons, preschool experiences, or extended family interactions, children learn how to get along with other children by being around other children. In order to successfully interact with others in these situations, preschool teachers should teach children how to initiate and maintain interactions with others, to solve problems, to communicate their emotions in appropriate ways, and to control their anger (Fox, et al., 2003).Take advantage of children’s personalities and activity preferences when engaging them in activities with other children. If a child is a very active child, engaging in physical activities with other children might be more beneficial for that particular child than, for example, taking a trip to the local library for story time. They are likely to find “kindred spirits” with whom to interact, and to experience these interactions as enjoyable. It is important that young children learn to communicate their feelings and emotions as specifically and correctly as they can, as well as to recognize the emotions of others. Children need a range of “emotional vocabulary words” in order to do this, and preschool teachers are in a great position to teach a variety of these words to children. It is important, for example, that children understand the meanings and implications of words such as frustrated, proud, afraid, excited, worried, and confused. Teachers can model the appropriate use of these feeling words by expressing their own feelings as specifically as possible, as well as by pointing out specific feelings that they observe in the children. When reading out loud to children, teachers can frequently stop to discuss the feelings of the characters involved, and also ask the children how they might feel if they were in similar situations as described in the stories. It can also be helpful to have children practice labeling the emotions and feelings of other children either during role-playing activities or by looking at photographs of other children. The ability to listen to and follow directions is probably the most challenging behavioral skill that a five-year-old can accomplish. Children must direct and sustain their attention on someone else, understand what is being said, remember what to do, and then successfully execute the directive. To teach these skills, start slow and simple with easy, one-step directions. It can be helpful to cue children with an auditory signal, such as a clapping pattern, that alerts them it is time to stop talking and listen to the teacher. The children can repeat the clapping pattern back as an indication that they are ready to listen. Pairing auditory directions with visual cues, such as photographs or simple lists, can help children to remember the direction and stay focused while carrying out the specified behavior. Once single-step directions are effectively followed, two-step directions can be given. Again, visual cues such as photos in sequential order or a written list (for older children) can be very effective. In the school environment, children will be faced with a variety of social problems that they will need to be able to solve on their own or with minimal help from their teachers. Arguments on the playground, hurt feelings, frustration over what is packed for lunch, etc., are all potential minefields where a child can either learn to cope effectively or break down. Prepare children for these potential pitfalls by presenting hypothetical (or real) stories and scenarios to the children and then guiding them through the analysis and solution to each problem. Teaching a specific problem-solving strategy can be helpful: identify the problem, think of some solutions, discuss the pros and cons of each solution, choose a solution, and evaluate the outcome. The use of role-playing activities can serve as a great way for children to practice their problem-solving skills. In sum, research has indicated that skills related to children’s successful behavioral and emotional control are considered more crucial to their successful transition to kindergarten than their mastery of pre-academic reading and math skills. Teachers of daycare centers and preschools are in an excellent position to help foster the development of these skills for children, ensuring that they will be emotionally and behaviorally ready for the challenges of the formal school environment. Dockett, S., & Perry, B.(2003). The transition to school: What’s important? Educational Leadership, 60(7), 30-33. Fox, L., Dunlap, G., Hemmeter, M. L., Joseph, G., & Strain, P. (2003). The teaching pyramid: A model for supporting social competence and preventing challenging behavior in young children. Young Children, 58(4), 48-53. Heaviside, S., & Farris, S.(1993). Public school kindergarten teachers’ views on children’s readiness for school. Washington, DC: National Center for Education Statistics. Make this Mother’s Day Special! 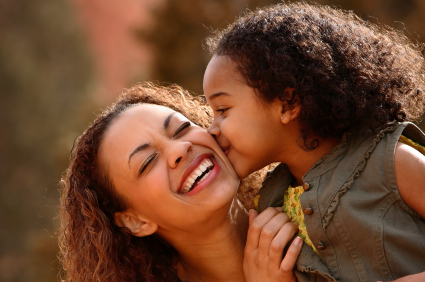 Flowers and cards are nice, but there are as many ways to show appreciation as there are moms. It’s time to give Mom a break and some special attention. From baking treats to taking over chores, here are some ways to make Mother’s Day memorable. Instead of getting Mom flowers, kids can make a delicious “bouquet” of treats! Barbecue skewer stems can sport a variety of flowers. For example, cookies that have a hole in the center can be held on the skewer with a gumdrop above and below. Skewers can be pushed into slices of refrigerated cookie dough and baked in. Pieces of fruit such as grapes, strawberries, and melon balls can be skewered as well. You might wrap the stems in green florist tape from a craft store and even add leaves. Flower shapes and colors can be varied using different cookie cutters and icing tinted with food coloring. Or instead of flowers, make the cookies into smiley faces or balloons. To celebrate good memories with Mom, have children choose some of their favorite pictures and make a family collage. (They can make color copies or print out pictures on the computer.) They should arrange the pictures on paper or poster board, then decorate the collage and/or write something about the pictures. Another way to gather favorite pictures is to make a photo book. Children could also draw pictures about Mom, make a video saying thank you, or take a special new picture. They could decorate a dollar-store frame or even make a frame (for example, using craft sticks). One of the nicest things kids can do for Mom is to take over preparing a meal. It’s not as hard as it sounds! Dad might cook something on the grill, and kids can help make other items. Sandwiches are easy to fix, and they can make mini-pizzas with bagels or English muffins, pizza sauce, and shredded cheese. Combine raisins, nuts, and a favorite cereal to make snack mix. You can get vegetables already cut up for salad. For dessert, make cookies using a mix (and decorate them), or make made-to-order ice-cream sundaes. Be sure kids clean up and put things away in the right place. Mom will be delighted! Also be creative about the container. It doesn’t have to be a basket – it can be a big bowl or a decorative storage box, for example. Make sure it is big enough to hold the things you want. You can put shredded paper, wrapping paper, or even cloth napkins in the bottom of the basket. Put your gifts in, with tall items at the back. You may want to add a bow. One great way to show appreciation for Mom is to give her some help! Have children do a little detective work and notice the things she does every day. Jobs may include making meals, vacuuming, and washing clothes. Have kids make a list of things they could help with and make “coupons” good for those chores. Maybe they could set the table or put dirty dishes in the dishwasher, help put away groceries, sweep the floor, or help make lunches. They should also think of things Mom likes that they can support – promise not to interrupt her workout or reading time, for example. They could even make a blank coupon for her to fill in! To make coupons, use a mini photo album or cut slips of paper and staple them together. Kids can write coupons by hand or make them on the computer (a large label format works well). Coupons can also be made to look like flowers! You can put construction-paper flowers in a paper pocket “vase,” or use craft sticks for stems and put them in a real flowerpot. Make sure the stems are long and thick enough for kids to write a chore on each one. It’s finally here! A book about emotional literacy for kids!! With all the emphasis on preparing our kids to succeed in a high tech, competitive world it’s easy to forget one of the most essential life skills—emotional literacy. 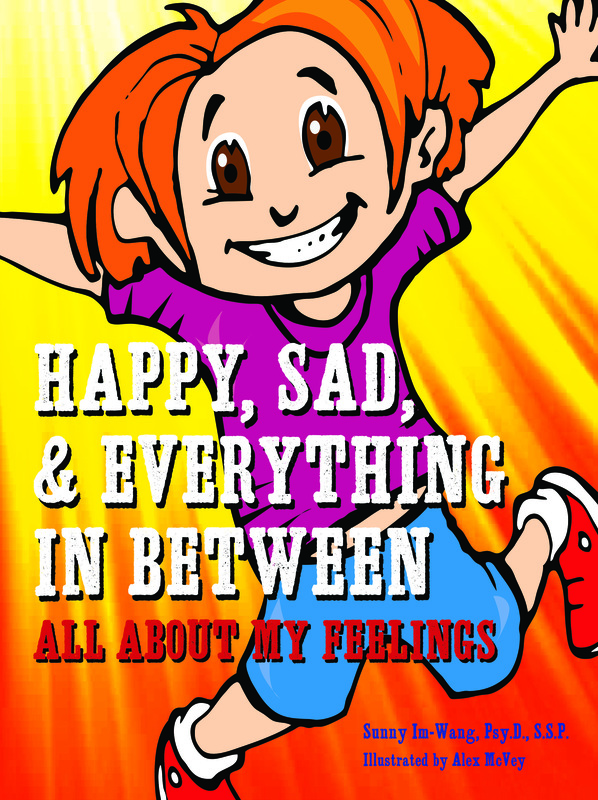 HAPPY, SAD & EVERYTHING IN BETWEEN: ALL ABOUT MY FEELINGS (lilSprout Press, April 2013, Hardcover) by Sunny Im-Wang, Psy.D., offers kids (ages 4-8) a fun and easy program to learn how to identify and manage their feelings. “Did you know that your feelings and your body are connected,” asks Kai, the narrator of HAPPY, SAD & EVERYTHING IN BETWEEN. She goes on to explain how various emotions feel in the body and how we can change our emotions by addressing our physical sensations. This not only provides kids with critical emotional literacy tools, but it also helps them identify feelings that they may not be able to articulate in words. This is an example of mindfulness in action. Each page of the book addresses a different emotion, including silly, jealous, shy, excited, loving, and lonely, and offers age-appropriate guidance for understanding and appropriately expressing all the feelings on the emotional spectrum. This book also includes kid-friendly, research-supported skills for relieving and managing difficult emotions, such as anger and frustration. These skills include mindfulness, which is the practice of being in the moment and recognizing physical and emotional sensations in a nonjudgmental way. This includes recognizing how emotions feel throughout the body—not just how they register on our faces. HAPPY, SAD & EVERYTHING IN BETWEEN helps kids understand the complex concept of emotions and gives them age-appropriate tools for managing them. Emotional literacy is the ability to identify, understand, and respond to emotions in oneself and others in appropriate and healthy way. It is easy to label emotions as good or bad, but it is important to help children understand that all emotions are valuable in that they can inform us of situations that we might want to change or avoid. Emotional literacy is essential to long-term success at home, in school, and throughout life. It can improve quality of life for children as they will feel more empowered by understanding emotions, which can sometimes be confusing, even for adults. Emotional literacy is not just about knowing the definition of each emotion. See how Happy, Sad, & Everything In Between: All About My Feelings can help you introduce emotional literacy to your child! In her new book Dr. Sunny Im-Wang, a pediatric psychologist, shows kids how to identify and manage their feelings—and have lots of fun while becoming emotion savvy. With all the emphasis on preparing our kids to succeed in a high tech, competitive world it’s easy to forget one of the most essential life skills—emotional literacy. HAPPY, SAD & EVERYTHING IN BETWEEN: ALL ABOUT MY FEELINGS, offers kids (ages 4-8) a fun and easy program to learn how to identify and manage their feelings. Each page of the book addresses a different emotion, including silly, jealous, shy, excited, loving, and lonely, and offers age-appropriate guidance for understanding and appropriately expressing all the feelings on the emotional spectrum. This book also includes kid-friendly, research-supported skills for relieving and managing difficult emotions, such as anger and frustration. These skills include mindfulness, which is the practice of being in the moment and recognizing physical and emotional sensations in a nonjudgmental way. This includes recognizing how emotions feel throughout the body—not just how they register on our faces, which too often is the only way kids are taught to identify feelings. It’s almost here! Spring break! If you’re not going away during this break, filling kids’ time during spring break is always a challenge. Here are a few ideas for active, creative fun. You can make this kite together and then try flying it! You will need wooden dowels, one shorter and one longer (such as 2 and 3 feet), a large brown paper or white plastic trash bag, and ribbon. Tie or tape the shorter dowel partway down the longer dowel to make a cross. Cut the trash bag open, flatten it, and draw an outline around the dowels. Have children decorate inside this kite shape. Then cut out the kite, leaving a margin. Tape the dowels to the back of the decorated paper or plastic with packing tape. Fold the edges over and tape them down, making sure the ends of the dowels are taped securely. Cut ribbon about twice as long as the kite and tape it to the bottom point. Tie several short pieces at intervals along the tail. Attach the end of a roll of string to the kite where the dowels cross. A fun activity easily adjusted to children’s abilities is an obstacle course. This is ideal outdoors but also works indoors. You can make the course just a few “stations” or longer. Create obstacles and other supplies from whatever is available: sofa cushions, stuffed animals, etc. The course can incorporate various movements. Walking can be following a marked path, stepping over something (or inside a hula hoop), “walking a tightrope” (a line on the floor), or squeezing between two objects. Kids can crawl under a table, between cushions, or through a large box. Add jumping/hopping too: children could proceed to a certain spot and then do several jumping jacks or a somersault. 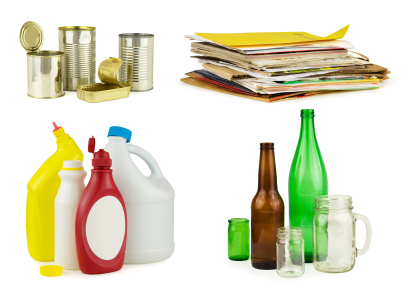 Other actions include pushing/pulling/carrying something, bouncing a ball, or tossing beanbags into a trash can. As children get the hang of the activity, they may enjoy timing themselves. Kids love to put on a show! Spring break is a great time to do a longer activity, or you can keep this simple. Have children pick a favorite story and list the characters. Talk about what they say and do at the beginning and then what happens next until the end. Decide who will play each character (children can play more than one part). One character can be a narrator who remembers the story well (or follows a picture book). Others should practice listening to the story until their character is mentioned and then walking “on stage” and saying their part. Remind children to sound and behave like the character (e.g. big and scary, sleepy). To make the activity more theatrical, choose an area that has a place the audience can sit and a way for kids to enter and exit the “stage.” Kids can use their imagination with props and scenery or draw some on chart paper. They may want to make a mask for their character(s) and find a “costume” to wear. However simple or elaborate, this is a fun activity to videotape! You don’t have to wait for Cinco de Mayo to enjoy a piñata, especially this easy version! You can use a paper lunch bag, gift bag, or grocery bag. Decide how children will decorate the piñata before you fill it – drawing is easier on a flat surface, but wrapping streamers around it may be easier when full. The piñata should be filled only partially so it is not too heavy; fill the remaining space with crumpled paper. Fold and staple the bag closed, or punch holes and gather it. For a traditional Mexican look, kids can use tissue paper strips with a wide fringe cut on one side, gluing them around the bag (starting at the bottom) and attaching crepe paper streamers that hang down. Make sure to let the glue dry well before hitting the piñata! 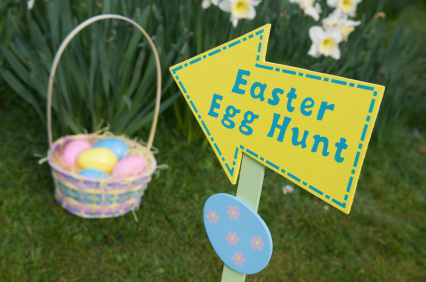 A traditional spring favorite, a simple egg hunt can work in your own space with little planning. The activity can be done in a park, a front or back yard, or designated rooms indoors. Hunting in snow can be fun as long as it’s not deep or slushy. For any location, think about safety issues like nearby traffic and tripping hazards. You will need about 10 eggs per child. There’s no need to buy Easter baskets; kids can use any container or could decorate a basic bag, basket, or pail. And think outside the candy box – treats inside eggs can include stickers, small toys, or a ticket for a special prize. You can adjust for age in several ways: give smaller children a head start, limit the eggs a child can find, create teams, or have different ages search in different areas/rooms or for different-colored eggs. Hide the eggs in obvious or trickier places depending on age, and make sure kids understand the rules (including off-limits areas where none are hidden). To lengthen the activity, have children take turns looking. (You can also hide the eggs more than once.) Vary the activity by giving kids a simple picture “map” of where eggs are or having them look for an egg marked with the letter their name begins with.